A couple of weeks ago I shared that DH and I had cleaned our garage and had a big pile of things to take to the city's Recycle Event. 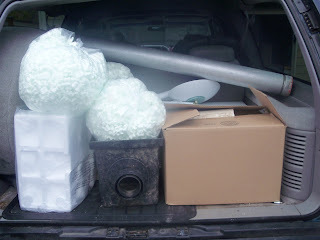 That event was this past weekend and DH took one of the kids and a car full of stuff to recycle. These photos simply don't look nearly as exciting as they Should given how excited I was about sending all of this away, but Oh! how wonderful it was! We've taken things to an event in the city where we used to live, too, and there were similar set ups. Basically you drive into the big parking lot that's being used for the event and stop at various stations to unload your cargo in the appropriate place. It's sort of like a big obstacle coarse that you traverse very slowly. 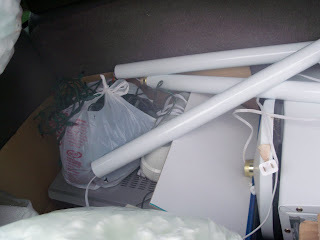 This time we were able to recycle/get rid of: expired prescription drugs, three bags full of styrofoam packing peanuts, another bag full of styrofoam 'blocks' that come with electronics, batteries, computer speakers, cable boxes (a friend's), a hand mixer with a burned out motor, a microwave, broken Christmas lights, a broken halogen lamp from college!, a 4' metal pipe, a 12' plastic pipe (in pieces), a plastic drainage box (dug up in the yard), and a wooden pallet (also a friend's). It feels so great to have all this out of the garage! And even better knowing that it's all going to be recycled and/or properly disposed of!